You have state of the art instruments on board (GPS, compass, heading, etc. ) What about speed, or leeway? Paddle-wheel speed sensors are an age old problematic technology that are frustrating to say the least. And, direct leeway readings were non-existent… UNTIL NOW! Is it Magic? Many think so, yes. – To us, its a 40 year history of designing, perfecting, and manufacturing electromagnetic sensors for municipal, industrial, commercial, and marine applications. Step into our world and experience low maintenance, deep signal penetration, wireless interface, and incredible accuracy. Did we mention Leeway is directly measured ? Solid state electromagnetic sensor measure forward speed with incredible accuracy. Deep penetrating signal goes down to depths of up to one foot below your hull. The missing piece of the puzzle has been found. Solid state electromagnetic sensor measure leeway speed with incredible accuracy. Deep penetrating signal goes down to depths of up to a foot below your hull. Our system fits directly into your existing hull penetrator. Rest assured, no additional modifications are necessary. Sensor fits directly into your existing hull penetrator. No modifications are necessary. 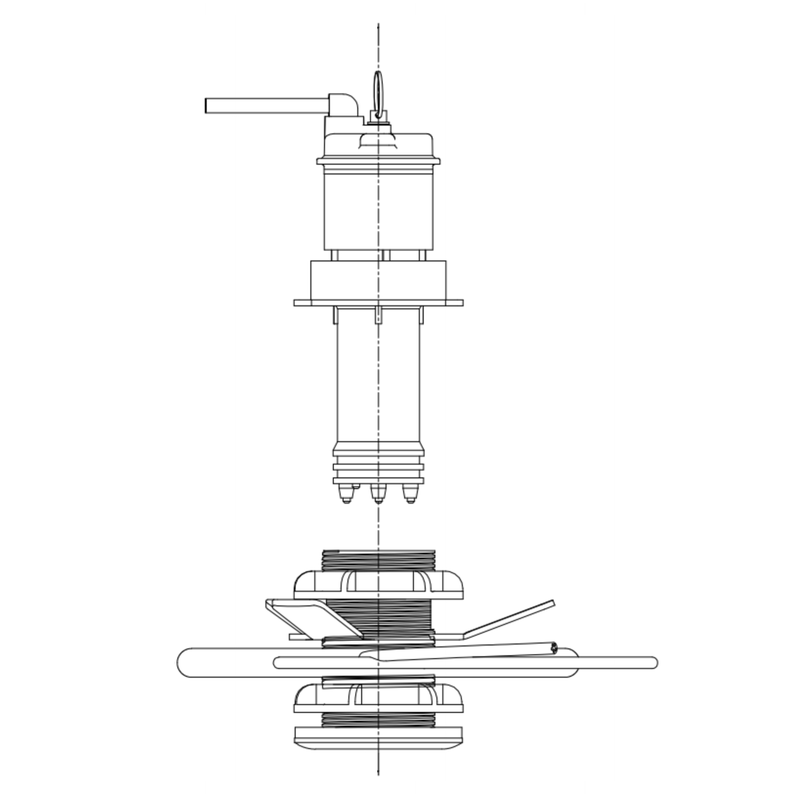 The coil propagates a deep signal well below what conventional paddle sensors can achieve. The retaining clip keeps the coil centered and secure to the boat hull. No drilling required. Two pairs of stainless steel electrodes pickup both the forward speed and leeway speed signal voltages. revolutionary sealing technology virtually eliminates any water intrusion when removing the electrode assembly for cleaning or maintenance. Sensor data is polled 2x per second. Forward speed, leeway speed, and leeway angle are output via Wi-fi and NMEA 1083. Additionally, forward speed is output via open collector pulse. 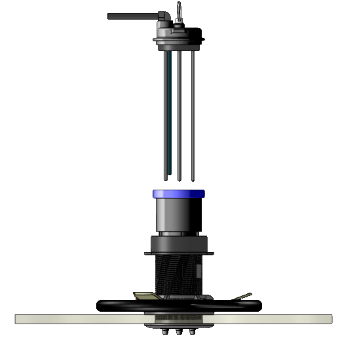 Complete sensor assembly is a direct replacement for existing paddle wheel installations. No additional hull modifications are required. 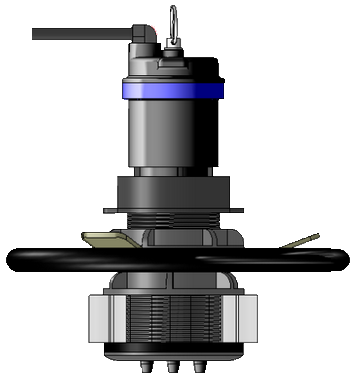 Locking Ring draws the assembly together, forming a watertight seal. Stainless steel electrodes can easily be removed from the sensor body. This makes inspection and cleaning of the electrodes simple with virtually NO water intrusion in your boat. Electrode seals are specially designed to naturally close when the electrodes are removed. Electrode tips, combined with a deep penetrating electromagnet, allow for signal detection up to 2 feet below your boat's hull. Electromagnetic coil generates a deep penetrating field up to 2 feet below your boat's hull. Coils can be manufactured different sizes depending on your application and space available. Cross section of a boat hull. Existing hull penetrator is used so no modifications are necessary. 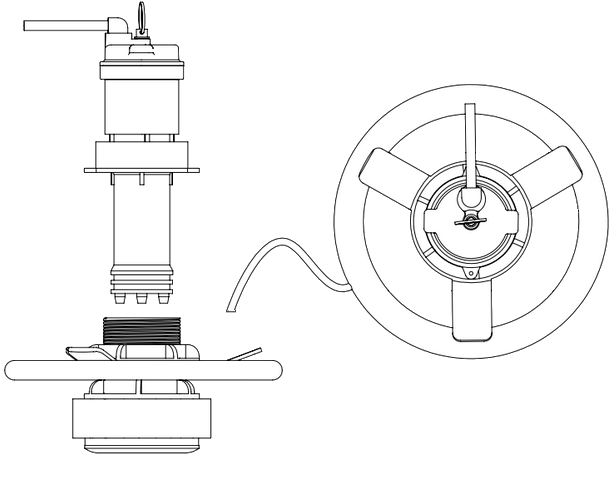 The sensing system is based on Faraday’s law of magnetic induction. An electromagnetic coil generates a magnetic field below your boat’s hull. As you move through the water, a signal voltage is generated within the field. The signal voltage strength is proportional to the speed at which you move (the faster you go the higher the signal voltage). Electrodes pickup these signals, where they are processed into a highly sensitive and accurate boat speed. One pair of electrodes is used for forward speed and one pair is used for leeway speed. How do you measure leeway? Leeway is measured with the same technique that we acquire forward speed. The only physical difference is that we incorporate an extra pair of electrodes perpendicular to the forward speed electrodes. Advanced software and circuitry read both forward speed and leeway speed. This is an industry first! Past EM speedometers were no more accurate than a paddle wheel. How is yours different? Prior EM sensors had a small electromagnet in the sensor tip creating a strong, local magnetic field. This small, localized field allowed only for the measurement of the speed very close to the boat’s hull– in the turbulent boundary layer. This caused significant measurement errors as the boat’s boundary layer changed with speed- in unpredictable ways. The Brickhouse sensor uses a large magnet, separate from the electrode assembly, that energizes a volume of water 100’s of times larger than prior EM sensors. The sensed flow signal contains flow information from up to 1-2 feet, depending on the coil size. I have heard the past EM sensors were adversely affected by electrical noise such as power lines, etc.? In the past this was true- yes. The Brickhouse EM boat speedometer has special circuitry isolated from extraneous electrical noise sources. Also, a software selectable frequency rejection of 60 Hz or 50 Hz is provided for additional protection from electrical noise near ports. This covers the standard line frequencies used by all countries across the world. How does marine growth affect the sensor’s accuracy? Compared to Paddlewheel sensors… very little. Since there are no moving parts to slow or stop the sensor, effects of fouling are minimized. To further reduce any marine growth, the sensor body is coated with special marine grade anti-fouling paint. Since the separate electrode assembly can be removed with virtually no water intrusion you can safely clean the electrodes with a rag, and reinstall them. Even young family members can do this without supervision. When this process is done, you will be pleasantly surprised to see virtually NO water leakage into your boat. Customers always have a big smile on their face when they see this feature in action! Does the performance of the EM sensor change when used in fresh water vs sea water? No. We have 40 years of designing EM sensors for everything from measuring flow in rivers to measuring the flow velocities across a Nuclear Submarine. We have created sensing electronics that measures accurately over a broad range of flow conductivities from mountain streams to the oceans. This technology is now available to the recreational boating community. How quickly does the Brickhouse speedo respond to changes in speed? Direction? The Brickhouse EM boat speedometer is sampled 2 x per second. The software setup allows you to input a dampening filter of 1-5 seconds. So, the response time is very fast! What size is the coil? The coil sizes range from 3 inches ID to 8 inches ID ( 5 inches OD to 10 inches OD). The larger the coil, the greater the signal penetration beyond the hull’s boundary layer. Measure your available space around the hull penetrator in your boat. This will determine the maximum size coil you can use. My hull penetrator is not aligned exactly with the centerline of my boat. Do I have to reinstall the hull penetrator? Most professional installers do a good job aligning the hull penetrator properly. When this is not the case, speed and angle are not correct. You may not have noticed the misalignment when using a single axis sensor such as a paddlewheel or an Airmar ultrasonic sensor because the forward speed is less affected by misalignment than is the leeway speed. The Brickhouse EM boat speedometer includes software that allows you to “electronically rotate” the hull penetrator to correct for misalignment of hull penetrator installations. What data outputs do you provide? Wi-Fi – Most smart phones & tablets (iphone, ipad, kindle, android, etc.) work just fine with the Wi-Fi interface. Pulse Output – Forward speed is available as an open collector pulse output thru the associated connector on the PC board. "Amazing! For the first time, I can actually get a direct readout on Leeway." "Fantastic! I rarely pull the electrodes out to clean them. When I do, virtually no water enters my boat ." "This is ground breaking stuff. I have information that has been unavailable and I can easily view it on my Kindle reader"
Brickhouse Innovations develops and produces electromagnetic sensors for measuring speed of water and rate of flow for municipal, industrial, commercial, and marine applications.